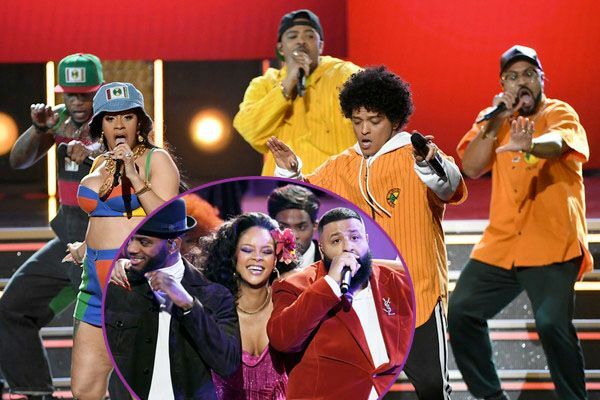 This year’s Grammy Awards brought some fun performances, especially for Hip Hop heads. It was more of a mix of YBF entertainers hitting the stage to keep the awards ceremony from being so boring. By the way, Kendrick swept the awards show trophies, winning four Grammys for Best Rap Album, Best Rap Song, Best Rap Performance and Best Rap/Sung collaboration with Rihanna. 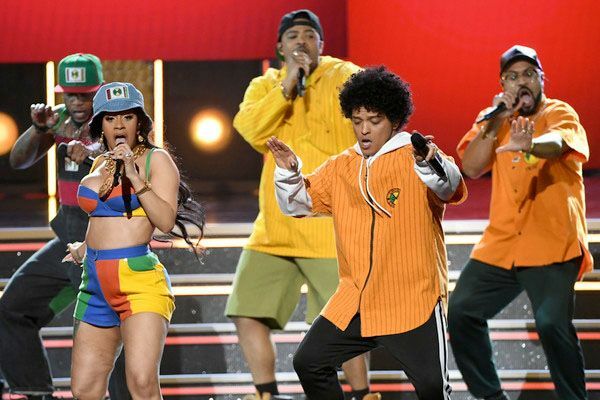 Bruno Mars and Cardi B, both in head-to-toe Cross Colours outfits, rocked the arena with their infectious ‘90s ode, “Finesse.” Their performance was similar to the video treatment, keeping the “In Living Color” elements and lively dance moves. Bruno was also a big winner last night, winning a total of 6 Grammys. Congrats! 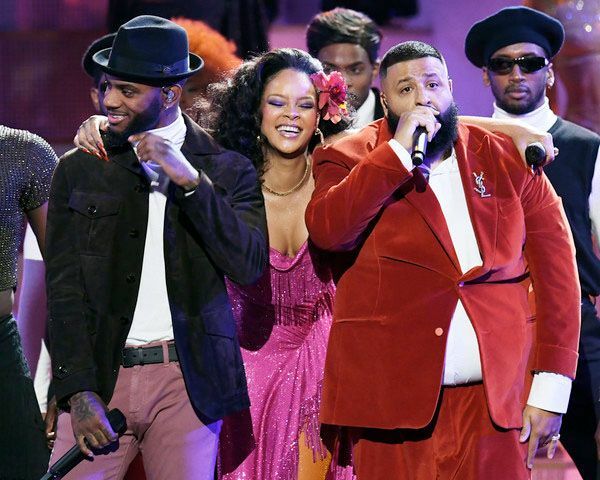 DJ Khaled is always the life of the party and kept the party going with his “Wild Thoughts” set, also starring (thick) Rihanna and Bryson Tiller. RiRi was on point with the choreography as she busted out some dance moves with the slew of dancers on stage. We have to say, this wasn’t her best vocal performance, but she still killed it. Donald Glover (formerly Childish Gambino) switched from his acting side to his artist side for a performance at the 60th Annual Grammy Awards. He treated Grammy watchers with his track "Terrified" alongside his super talented (and adorable) Lion King co-star J.D. McCrary, who will play young Simba for the animated reboot. The "Atlanta" star is set to play the role of Simba. Also, Mr. Glover confirmed he will no longer go by his musical moniker, Childish Gambino after his upcoming fourth studio album that he's currently working on. In fact, he said he's retiring from music. "I’m really appreciative of this. I’m making another project right now, but I like endings, I think they’re important to progress," he said. By the way, Donald won a Grammy in the Best Traditional R&B Performance category for "Redbone." Janelle Monae has never been one to bite her tongue when it comes to speaking out against social and racial injustices. And the WONDALAND honcho had a powerful message about the #TIMESUP movement during the Grammy Awards. Before introducing Kesha's performance, the singer/producer shared some powerful words about women standing up and fighting for what's right, including pay equality, discrimination, harassment and more. 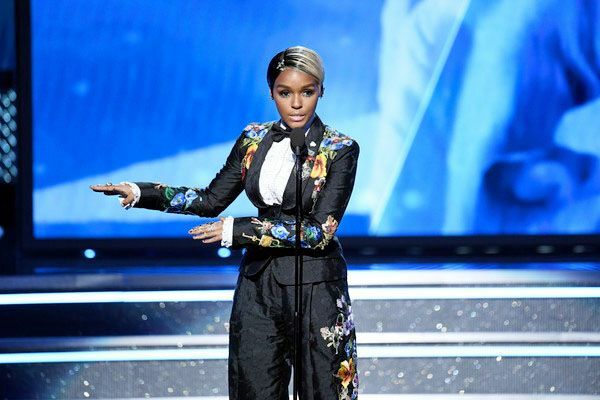 "Tonight, I am proud to stand in solidarity as not just an artist but a young woman with my fellow sisters in this room who make up the music industry," Janelle started off her speech. "Artists, writers, assistants, publicists, CEOs, producers, engineers, and women from all sectors of the business. We are also daughters, wives, mothers, sisters, and human beings. We come in peace, but we mean business. And to those who would dare try and silence us, we offer you two words: Time's up. We say time's up for pay inequality, time's up for discrimination, time's up for harassment of any kind, and time's up for the abuse of power. Because, you see, it's not just going on in Hollywood, it's not just going on in Washington -- it's right here in our industry as well. And just as we have the power to shake culture, we also have the power to undo the culture that does not serve us well. So let's work together, women and men, as a united music industry, committed to creating more safe work environments, equal pay and access for all women." We are so an agreeance with EVERYTHING she said. After Jay Z was SNUBBED for all 8 awards he was nominated for, his mother-in-law Tina Lawson came through with the SHADE. Hilar!